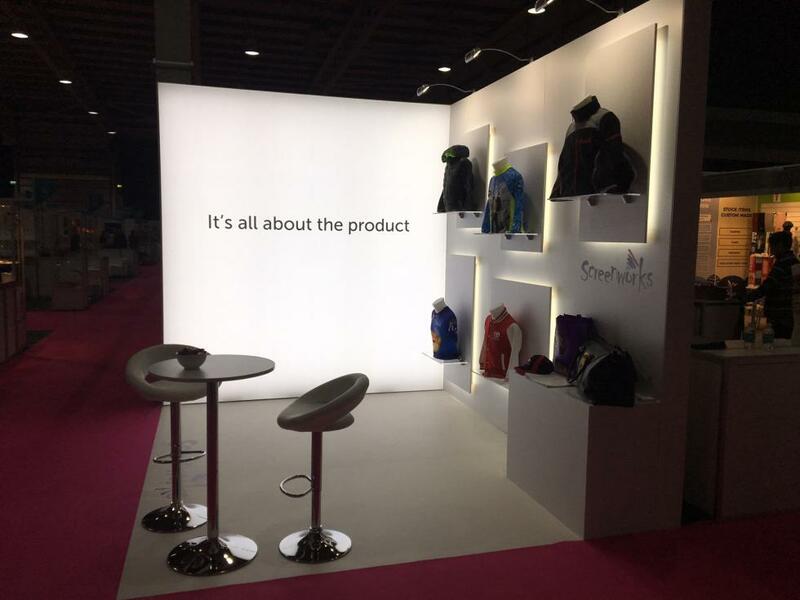 The UK's leading promotional merchandise distributer were looking for an illuminating exhibition stand for Merchandise World 2017. We were happy to oblige! 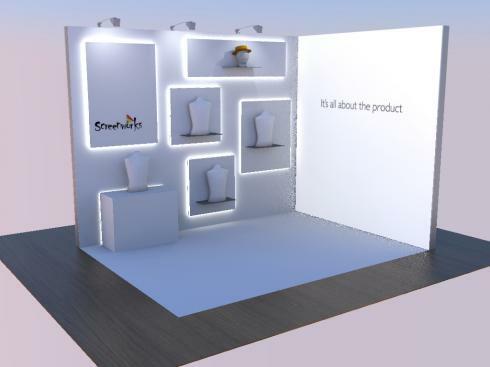 Screenworks wanted a bright and white exhibition stand with products at the heart of their display. Branding was to be modest and subtle with an overarching theme of 'It's all about the product'. They had secured a 3 metre by 4 metre, open two sides floor space at the Merchandise World Exhibition due to be held in Stoneleigh in September 2017. In order to provide an immediate visual impact we opted to create the 3 metre wall from a large 3 metre tall backlit LED lightbox. 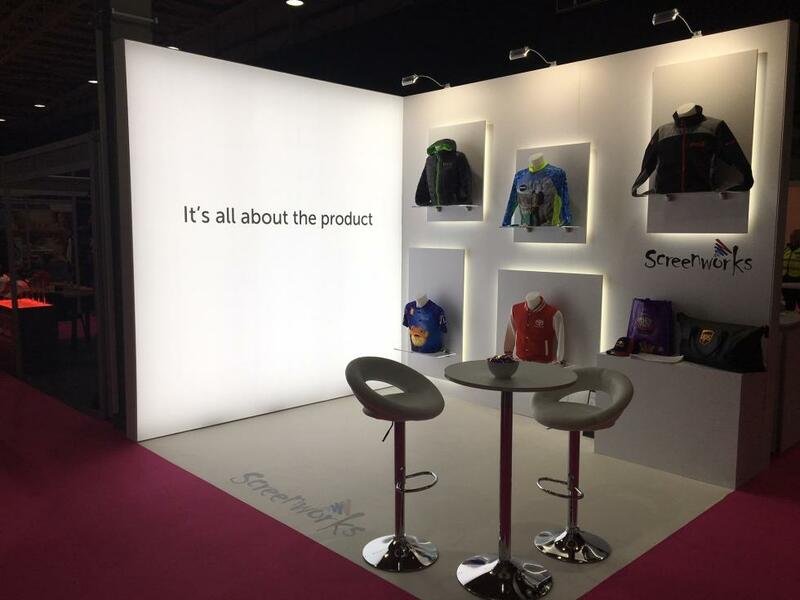 This wall was to illuminate the main campaign message of 'It's all about the product' and key to the success of this display was for the fabric graphic to be as plain as possible, ensuring the message was clear, concise and hard hitting. The 4 metre wall was clad in a clean white finish with minimal graphics and branding. Custom wall mounted product displays were stood off the 4 metre wall and backlit to create an impressive halo lighting effect. A small storage cupboard was created that doubled as a product display and somewhere practical to hide away merchandise. The floor was finished in a clinical white vinyl flooring with a vinyl cut Screenworks logo. 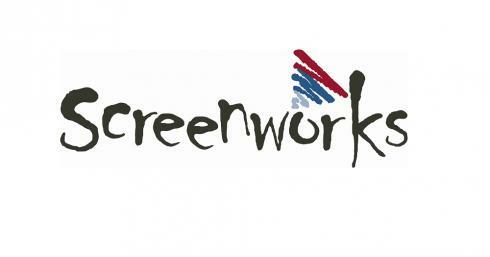 The Screenworks custom exhibition stand literally shone amongst the competition at Merchandise World 2017. The nearby stands and hall space was shadowed by the backlit lighting effects, clean lines and powerful messaging. If you would like to get in touch about your next event please call us on +44 (0)1733 570222 or complete our design brief form below.